SARPY COUNTY, Neb. (KMTV) -- — People in a lake community in Sarpy County say they're adjusting to their "new normal." Progress continues at Chris, Betty, and Hanson lakes; they are only a foot or two higher than normal levels. The SID President, Chip Frazier, is one of many whose homes are still uninhabitable. He's waiting to get a mold inspection before he can do other work like electrical repair. He estimates at least 10 homes in their community were completely destroyed and it will take a long time to repair. 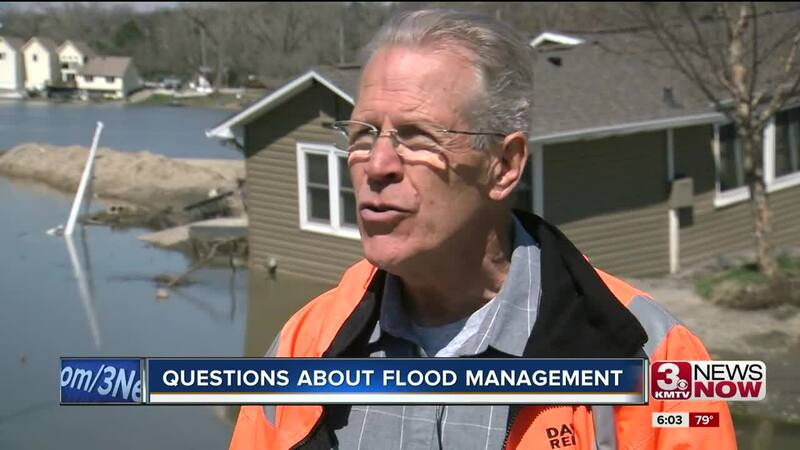 Frazier believes mismanagement north of Gavins Point Dam by the U.S. Army Corps of Engineers Flood Management Team is to blame for the destruction where the Platte and Missouri Rivers meet. "They sent a large volume of water down here at the same time that the Platte was coming to flood stage. The Platte had nowhere to go it ended up here, it ended up impacting these people's homes,” Frazier explained. "If the Corps of Engineers is responsible for the Missouri River Basin flood management don't take advantage of those huge reservoirs and draw down those reservoirs in the winter and the fall season then we're going to suffer this forever, I don't know." There are 5 reservoirs north that feed into Gavins Point, whose outflow spiked one day before the Elkhorn and Platte Rivers started flooding. Frazier estimates it will take at least a year to fix all the infrastructure issues at the lake community. USACE Omaha Office did not return a request for comment.